The Hawaiian green sea turtle is the endangered species in Hawaii that you probably heard most about. Known in Hawaiian as Honu, they are one of the most beautiful animals you will find in Hawaii. Honu are also deeply important in Hawaiian culture. One legend says that a Honu named Kailua was able to change into a human whenever she wanted to so that she could watch over the children as they played on the beach. Many local artists find inspiration from the Honu and you will see them depicted in paintings, art, home goods, and jewelry. Look for Honu as you kayak in the water or on the beach as they come up to rest. Although endangered, Honu are increasing in their population thanks to conservation efforts and education. The National Marine Fisheries Service, a United States federal agency responsible for the stewardship of national marine resources, protects Hawaiian green sea turtles. They also provide viewing guidelines. If you see Hawaiian green sea turtles, either in the water or on the beach, you must stay at least 10 feet away from them. Don’t touch or feed them, either, but take as many pictures as you want from a safe distance! Although they can live for around 60-70 years, one of the biggest dangers to Hawaiian green sea turtles is Fibropapillomatosis, which causes tumors to grow and can impact their ability to eat or move around. The Hawaiian monk seal is another endangered species in Hawaii and is one of the most endangered marine mammals in the world, according to the National Marine Fisheries Service, which also leads the effort to protect Hawaiian monk seals. Conservation efforts have increased the size of the monk seal population. 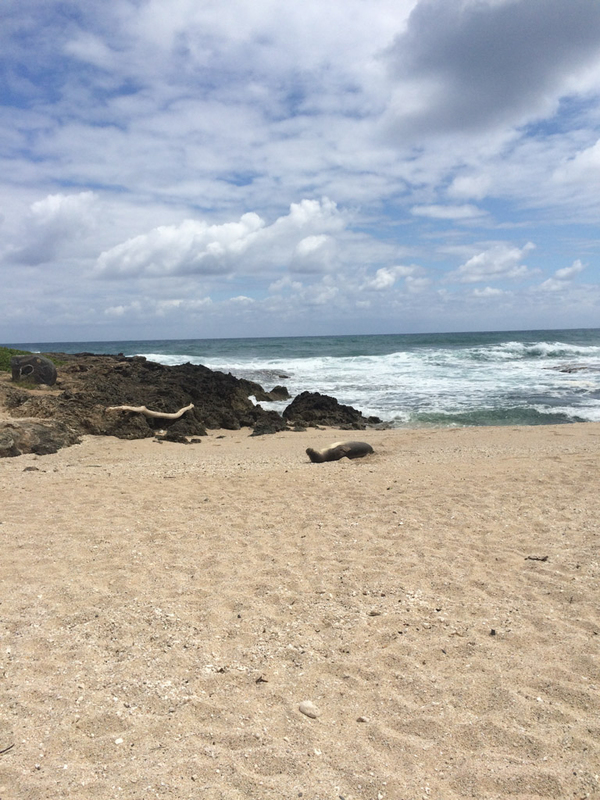 In order to continue to protect Hawaiian monk seals and for your own safety, the National Marine Fisheries Service tells us to stay at least 150 feet away from them, whether they are on the beach or in the water. They often come up to the beach to rest for long periods of time. Don’t disturb their rest, and don’t feed them or touch them. But again, take as many pictures as you want! Oftentimes, when a Hawaiian Monk Seal is sighted, volunteers will put up signs and patrol the area asking people to stay away – that’s how rare they are. Hawaiian monk seals are dark gray or brown and can weigh between 375 and 500 pounds — another reason to stay out of their way! You can usually find them alone, laying on the beach or swimming in the water. If you don’t get to see them in the wild, the Waikiki Aquarium has both Hawaiian monk seals and Hawaiian green sea turtles. To see these two speical animals alone makes the zoo worth the trip!